Choosing a Single Booth Package takes the guess work out of creating your own individualized exhibit booth. The Single Booth Package provides you with everything you need for a 10′ x 10′ booth, from uprights, bases, and telescopic drape supports to drapes and even carry bags. All you have to decide is whether you want tall or short side walls and what color drapery you prefer. 600002 IFR Banjo Cloth Drapery Panel, 8’h. 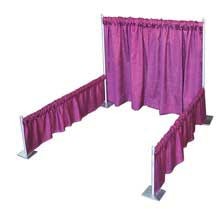 Choice of standard color, top & bottom finished with pipe pockets for use with telescopic drape support, side selvedge. 600001 IFR Banjo Cloth Drapery Panel, 3’h. 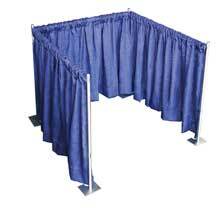 Choice of standard color, top & bottom finished with pipe pockets for use with telescopic drape support, side selvedge. 1Complimentary Medium Drapery Panel Storage Bag, Holds up to 75 lbs. All special order drapery is non-returnable. 600002 IFR Banjo Cloth, Drapery Panel 8’h. Choice of standard color, top & bottom finished with pipe pockets for use with telescopic drape support, side selvedge. 1Complimentary Medium Drapery Panel Storage Bag. Holds up to 75 lbs. Be sure to consider our digital printing textile service which allows you to have your own graphics and logos on your custom drape panels. Need to Rent it? Please visit Rent What? Inc.